Since 2008, FAU’s degree programmes and quality management in teaching and studying have been undergoing various accreditation processes and audits carried out by external reviewers, resulting in development in these areas. In 2009, the Executive Board decided that the University would develop an internal quality management system for teaching and studying based on the requirements for system accreditation. The system accreditation process focuses on assessing organisational development at FAU in the area of teaching and studying, allowing the University greater flexibility in the design of a quality management system that meets the needs of higher education. 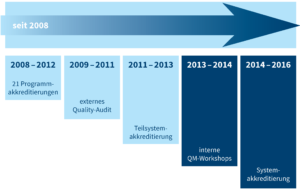 Overall, the University sees this process as an opportunity to design quality management instruments and structures on the basis of FAU’s targets, while taking into account the criteria for degree programme accreditation, and to ensure that these instruments and structures are also effective on the degree programme level. In preparation for the system accreditation process, 21 degree programmes at FAU’s faculties were successfully accredited within 12 programme accreditation processes by the end of 2013. This allowed each Faculty to gain experience of the requirements of external quality assurance processes. The School of Business and Economics was the first unit at FAU to establish its own comprehensive quality management system. This process carried out at the School and the way in which it was linked to centralised, university-wide quality management processes underwent a quality audit by the evaluation agency evalag between 2009 and 2011, which led to further development of the system. FAU began a partial system accreditation process for the School of Business and Economics in October 2011. Parallel to this process – which was used as a pilot project – the Executive Board determined additional steps for FAU to prepare for a system accreditation process for the whole University in 2011. Two quality management workshops with external advisors were carried out in the summer semester 2013 to support FAU’s remaining faculties and schools with the implementation of their own quality management structures. FAU was granted partial system accreditation by the accreditation agency ACQUIN in July 2013 after successfully completing the process and fulfilling all requirements. After submitting an application, FAU was admitted to start the system accreditation process by the accreditation agency AQAS in November 2013. The first visit from the reviewers took place on 9–10 February 2015 and focused on FAU’s system for quality assurance in teaching. After the visit FAU received positive feedback from the reviewers and the agency. The second visit, during which the quality management system will be assessed on the basis of random sampling (characteristics and degree programmes), is scheduled to take place on 25–26 January 2016. The process is expected to be completed in the second quarter of 2016.